A new thriller from the author of the Amazon.com bestselling Alice in Deadland trilogy. When there were still people around to talk to, I would introduce myself as a drinker with a writing problem. It sounded witty at the time, and certainly got a Read More..
No reviews available for #ChroniclerOfUndeadBook, Do you know Chronicler of the Undead?, Please add your review and spread the good things. I'm a huge fan of Horror films.But when it comes to books,I try to avoid them as far as possible.Somehow,I feel that the 'scare factor' is lost when it's read.I had tried reading a couple of Stephen King novels a couple of years back ,but couldn't finish them as the 'horror element' didn't work for me at all.So,when this new book by Mainak Dhar came to me for review from writers melon,I was a bit apprehensive initially to pick it up as it belonged to the horror genre.Anyways,I decided to give it a try as it wasn't a very lengthy book. 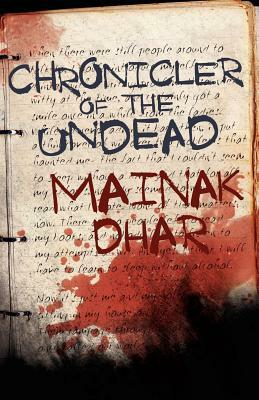 Mainak Dhar is one of the few Indian authors who writes Horror fiction(well,I've done my bit of research on him by now).Set in the backdrop of a Zombie apocalypse,'Chronicler of the Undead' is a horror tale laced with humour.The hero/narator is an army man- turned -writer who is the last man surviving after the ZA.He is staying in an isolated mansion on top of a hill and is currently running out of food and water.With zombies roaming around in the streets,his survival instincts are put to test.However he chronicles his day to day activities and his struggles for survival in his journal. There aren't many characters in this book apart from the protagonist,the Zombies and the 'gentlemen' whom he encounters.Pretty soon he realizes that it's not only the 'Morekos' whom he has to fight with.The book is essentially about the hero's fights for survival and has traces of movies like 'I am Legend'. The book didn't 'scare' me that much but with it's twists and turns,it did manage to surprise me a few times.The language used is pretty simple and conversational without any literary pretensions.It has got a nice suspense towards the end and at less than two hundred pages,this is the kind of book which can be finished in just one setting.On the downside,'Chronicler..' is definitely not everyone's cup of tea and if you are looking for a breezy romantic tale for your weekend reading,this is just not the book for you.